CNG: The Coin Shop. ETRURIA, Populonia. Circa 300-250 BC. AR 20 Asses (22mm, 8.65 g). ETRURIA, Populonia. Circa 300-250 BC. AR 20 Asses (22mm, 8.65 g). Facing head of Metus, hair bound with diadem; X : X (mark of value) below / Traces of FVFL(?) in blank field. EC Group XII, Series 37, dies O1/R1; HN Italy 142; SNG ANS 79 (same dies). Near EF, toned, struck on a broad, oval flan. Excellent metal for type, lacking the usual unslightly die break. Like the Romans, the Etruscans of northern and central Italy were latecomers to the Greek concept of coinage. The origins of the Etruscans are still regarded as enigmatic, and their language survives only in the form of relatively short inscriptions. 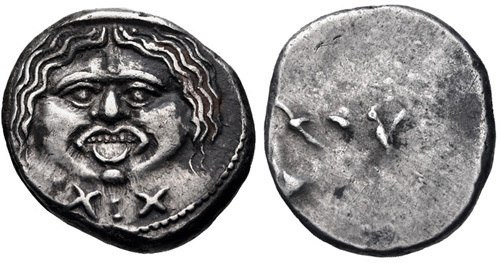 When they did begin striking coins in the mid 4th century BC, many of the distinct and whimsical qualities of their culture came through. Only five Etruscan cities struck coins in any quantities, with Fufluna, called Populonia by the Romans, by far the most prolific. Their quirky designs do not owe much to Classical Greek numismatic art. Here we see Metus, the Etruscan version of the Gorgon Medusa, depicted frontally in a manner that nearly fills the entire obverse. The Etruscans typically used marks of value employing numerals in their own alphabet, later familiar as “Roman” numerals: the numerals X : X here value this piece at 20 units, traditionally thought to be the Italic “as” also employed by the Romans. Another feature of Etruscan coinage is that it tends to be one-sided – that is, having an obverse design and an essentially blank reverse. The only reverse “design” here, much more distinct here than usually seen on this type, are crude Etruscan letters spelling out the city ethnic. This tells us something about Etruscan coin production methods: Their mintmasters perhaps just used the broad face of the hammer itself, sometimes, but not always, inscribed with letters or other sketchy designs, to ram the metal into the obverse die, rather than employing a punch die.